Ingredients: sugar, corn syrup, corn starch, water, citric acid, iodized salt, Sodium Citrate, Malic Acid, Chili, Salt, Arabig gum, Artificial Flavors and colors: FD&C Red No.40, FC&C yellow No. 5, FD&C Blue No. 1 and Sodium Benzoate as preservative. Ingredientes: az�car, glucosa, maltodextrin, �cido c�trico, citrato de sodio, �cido M�lico, Chile, sal, goma �rabiga, Saborizantes y colorantes Artificiales: Rojo Allura AC (En EUA FD&C Rojo No.40), Tartrazina (En EUA FD&C Amarillo No.5), Azul Brillante FCF (En EUA FD&C Azul Brillante No.1), y Benzoato de Sodio como conservador. these are nice chewy candies! Enjoyed them. 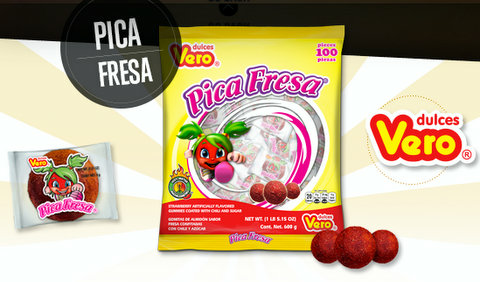 My salivary glands are swelling just thinking about this candy! 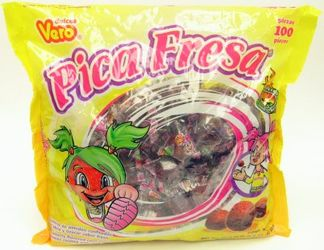 THIS CANDY IS MUY BUENO! CHEWY TASTY GOODNESS!! This is such a good piece of candy, and i enjoyed every peice! Will buy again!